"Tranquila, tranquila," the words echoing through my cerebrum. Another head-high to slightly-overhead wave coming in out the back. "I don't think I can do it," I said to my surf teacher in Puerto Escondido, Celestino Rodriguez. But by the time the words rolled off the tip of my tongue it was too late. I was gone, into the wave, holding on, just hoping I'd make the steep drop. 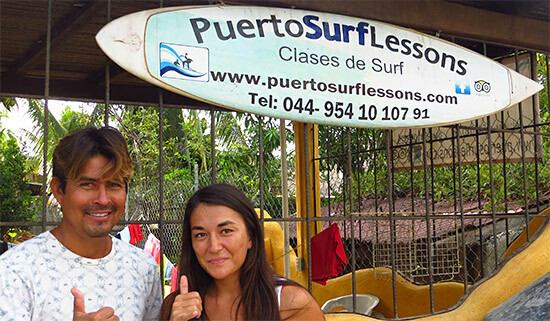 A Puerto Escondido native, Celestino Rodriguez owns Puerto Surf Lessons with his beautiful wife, Melinda Nickel. 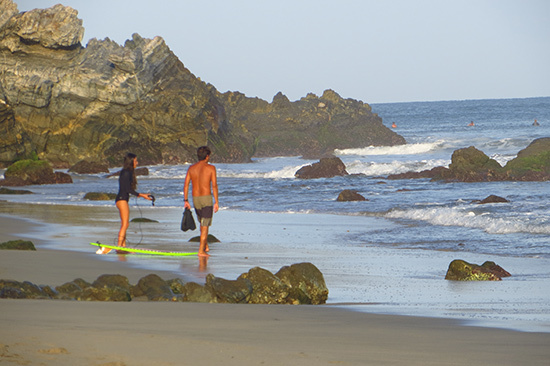 A surfer and a lifeguard at Zicatela in Puerto Escondido, you would swear salt water runs through his blood. Photographed, written about, spread all over the Internet through popular publications like SurferMag and Surfing Magazine, the truth is I had no idea who, what or where Zicatela, Puerto Escondido was before my Dad suggested it as our next family vacation destination. I shrugged, "Puerto where?" It took only one photo to sell me. Zicatela... just the sound of the word and a surfer's heart accelerates. It is called the Mexican Pipeline, and for good reason. 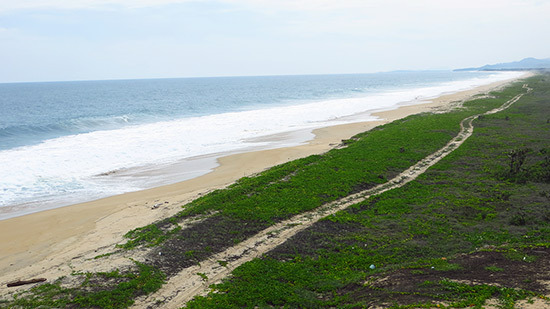 Tucked into a curving part of the southern half of Mexico's Pacific Coast, Zicatela is the main surf beach in Puerto Escondido. Like a machine, it produces perfect wave upon perfect wave. 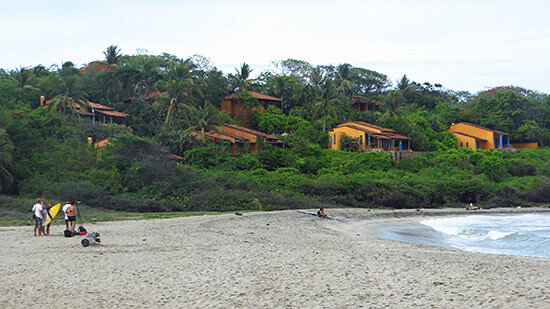 Part of a larger trip to Mexico, Puerto Escondido would be our home for one week. 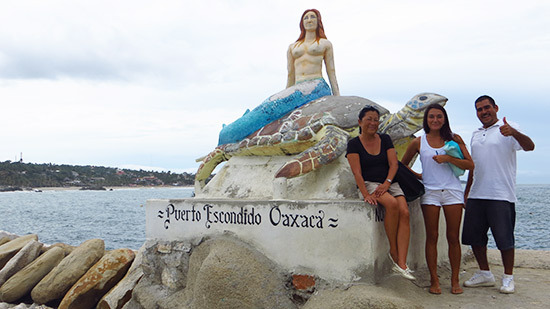 Warm, tropical, ripe with the freshest of avocados and mangos, alive with kind people and a safe, tranquil vibe, Puerto Escondido is widely loved for being one of the only beach communities in all of Mexico to remain so unspoiled. 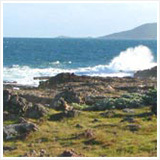 Zicatela is the main draw, a town with a pulse driven by surf. 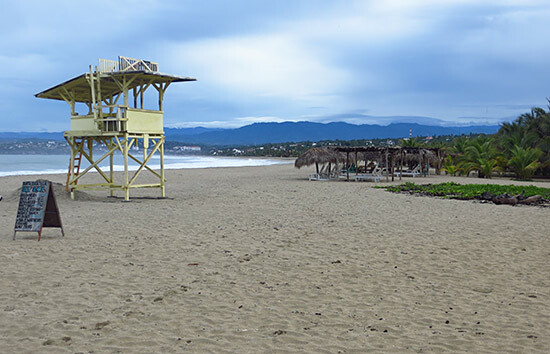 Local markets and shops fill the city center, while inexpensive hotels, restaurants, boutique and surf shops line Zicatela's main street that runs parallel to the long, wide stretch of beach. In search of boots-on-the-ground local knowledge, we met up Juan José Cortes to show us Zicatela and the surrounding areas. 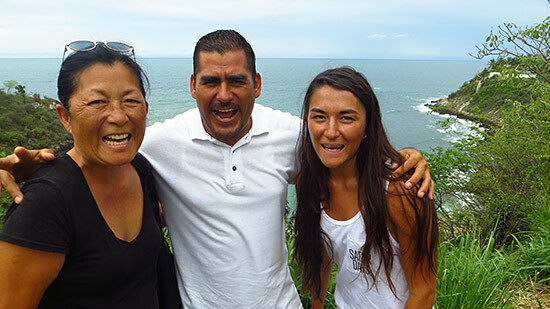 Making us feel right at home, he gave us a good lay of the land, introducing us to many hidden gems up and down Puerto Escondido's coastline. From showing us the best restaurants in town, to introducing us to the Strangler Tree, to negotiating tricky roads with my Dad as navigator (and commander in certain cases! ), the memories are many with Juan José. Ultra-selective, skilled Zicatela surfers wait for just the right wave to roll through. Too big, too heavy, too likely to close out and they pass. When that gem appears? Drop in, pull in and try ride it as fast as you can before making a swift exit. Knowing Celestino not only surfs Zicatela, but saves people from it put me right at ease. He knows conditions good and bad, what to watch out for and, of course, how to rescue you. 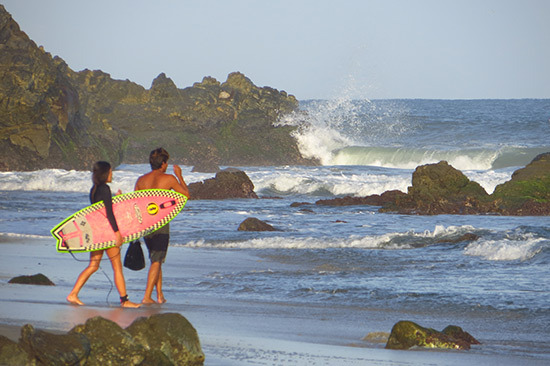 After choosing the board, we took a quick walk from their colorful home to La Punta. 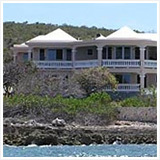 La Punta feels worlds away from Zicatela, but it is in fact just down the shoreline. Here, the waves are far more reasonable, attracting a fair number of surfers. Set waves were bigger than anything I had seen in Anguilla or St. Martin. The number of surfers in the water, good ones, jangled the nerves, too. I was out of my element. "Do not let panic set in." "Tranquila, tranquila," Celestino smiled, a gleam in his eye. With a particular air of confidence and calm, there is no doubt that his aura settles the soul, no matter how shaky and uncertain. The first day (of a five day surf lesson package) was all about getting me used to the spot. 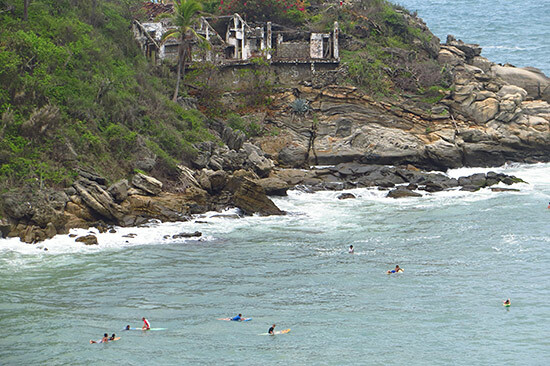 Small or big, La Punta is perfect for intermediate surfers. A left, the wave breaks far out on the rocks. Expert surfers catch the wave over shallowly covered boulders, navigating through channels of sharp edges, riding it all the way in, closer to the beach. The rest catch it there. With smaller conditions on day one, and on a longer board, everything was nice and easy. Fear soon dissipated as I surfed alongside other beginners. Truthfully, it was poor indication of days to come. When I think back on the days that followed that first morning, it all feels like a haze. Less beginners in the water, a shorter board and the biggest waves I've ever seen from the sea. "You can do it, Chica!!!" An all-addictive rush of speed as I dropped to the bottom of the wave would quickly follow. And then, that right-brain thought, "just don't fall now". So focused on keeping my balance through the first section of the wave, its size on my peripherals, fitting in a turn was not on the agenda. Making it down the face was the only thing on my mind. The paddle back to the peak was nearly as rewarding as the ride itself. From wiry and fast girls dropping in on the boys and shredding the waves to pieces, to 10 year old kids getting barreled and landing aerials, watching the local talent rip takes your breath away. 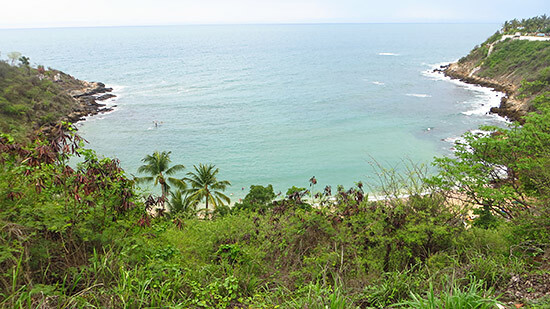 Carrizalillo is the third main surf spot in the Zicatela area, ideal for beginners. About a 10-15 minute drive from La Punta, it's as pretty as a postcard, reminiscent of the likes of Tortola or even Anguilla. Surrounded by high cliffs, you reach the beach by a steep set of stairs. 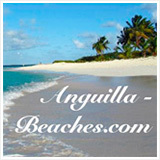 An inviting bay lined with a small spit of sand and a few beach bars awaits you at the bottom. A left point break, you can either catch the wave closer to the rocks (for more speed and a bigger thrill) or, if you are just starting out, you can catch it further in where it breaks a little more gently. There is a right break here as well, but you have to be pretty swift with your pop up and first turn to get it without being thrown into the rocks! As the days went on and the swell began to drop, my confidence grew. Celestino was the perfect fit for the early days, for encouraging me, pushing me into bigger and bigger waves. Aaron Martinez, who helps Celestino with lessons, was there when I was ready for more technical help. A younger surfer with a sweet and honest spirit, Aaron surfs Zicatela regularly. Truly into the sport, he showed me better paddling techniques and gave me several tips on how to make the most out of my ride. Despite the improvement, I continued to look longingly at Carrizalillo's big, beautiful, right. "Next time," Celestino promised. Until then, I replay those Pacific Coast waves and the sight of those fearless surfers who amaze you, who inspire you, who keep pushing you take your game further and further. 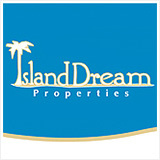 A big thank you to Melinda, Celestino and Aaron for opening my eyes and making me go for it. Surfing will never be the same. Puerto Surf Lessons changed everything! 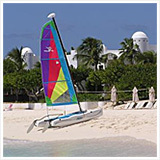 Puerto Surf Lessons offers a variety of very affordable packages for every surf level. 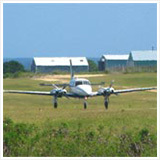 From beginner lessons to guided tours of locally-loved spots outside of town, they offer it all. 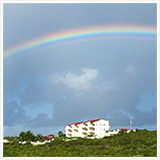 And, if you would like photos of the trip, let Melinda know and they will arrange for that, too! You can reach Melinda via the contact info below. Accommodating and quick on email, she goes above and beyond to get you all set up. Softer waves perfect for beginners. Manageable ones ideal for intermediates. 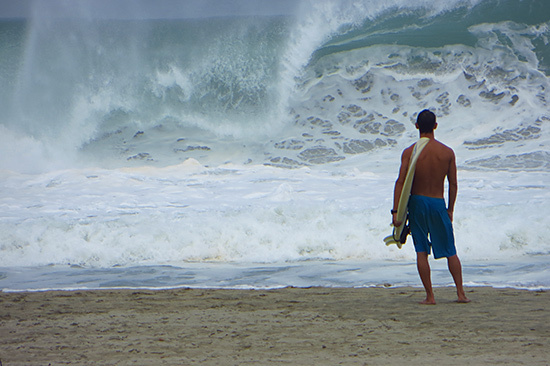 And harrowing, barreling beach breaks for the experts... these are three good reasons to visit Puerto Escondido. But, they aren't the only ones. 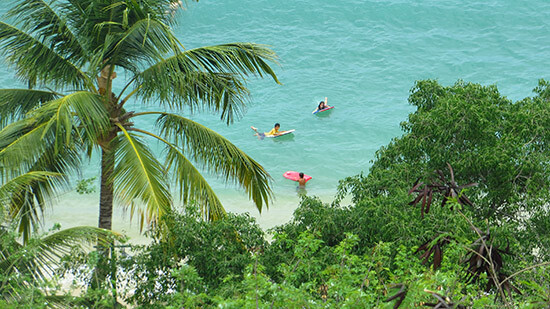 Though defined by its waves, Puerto is more than meets the eye. 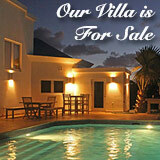 First, it's one of the highest value vacation destinations. 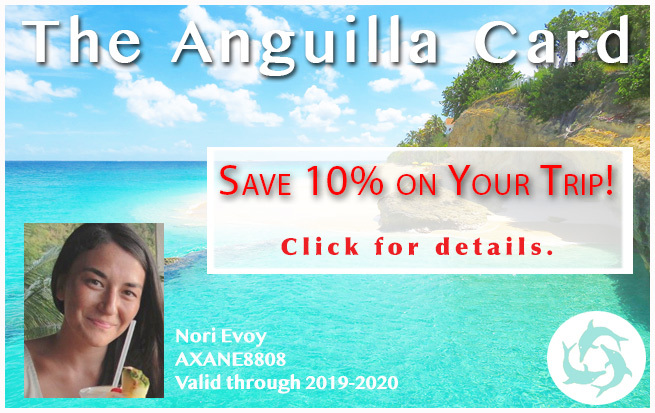 At an already affordable price point, when you consider the quality of food and surroundings, it's a deal that's hard to beat. Second, it is not overrun, touristy or dangerous. Whether walking the stretch of Zicatela or tucking into a quiet, undiscovered cove, it's a Mexican tropical paradise. And a safe one at that. 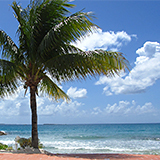 Upon departure, sitting on the tarmac in our InterJet back to Mexico City, gazing at the palms blowing in the breeze, something unexpected occurred. A beautiful moment, the ground crew lined up and waved good-bye to our plane. That gesture struck a chord. 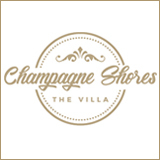 Warm and kind, with a genuinely welcoming vibe, that is the real reason to get here. 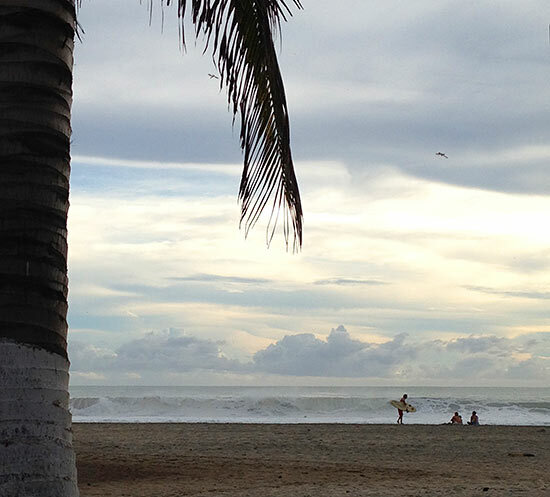 Puerto Escondido, you are a sunkissed, salty dream and we can't get back soon enough!